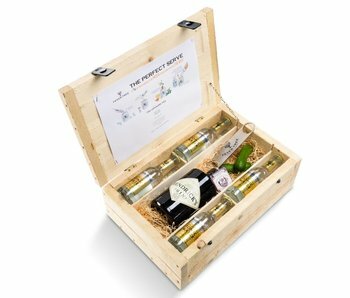 In the case of the Monkey 47 gin, the taste of juniper is most important, along with 47 botanical finds, including citrus and pepper. For the tonic in this package, Fever Tree Indian tonic has been chosen. This tonic is best complemented with the distinct taste of Monkey 47 dry gin to a surprising gin tonic. The combination with lime, juniper, citrus and pepper can be called bold. Taste the Monkey 47 gin and tonic and let the taste sensation happen to you. 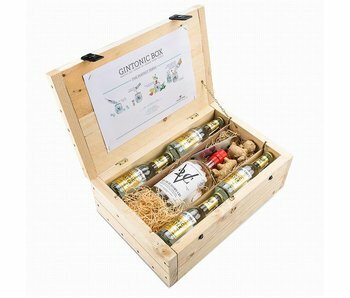 The wooden boxes from gintonicbox.nl lend themselves perfectly to original business gifts or a fun birthday present. An instruction is included in the box, so that the fresh ingredients are used as intended. The Fever Tree opener is one to keep.